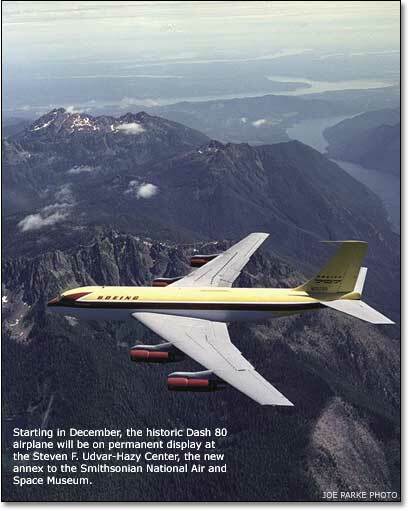 Editor's note: The Boeing 367-80, also known as the Dash 80, recently made its last-ever flight. The historic airplane flew from the Puget Sound area to the Steven F. Udvar-Hazy Center, the forthcoming new annex to the Smithsonian National Air and Space Museum in Washington, D.C. As a prototype jet transport airplane that spurred the development of the Model 707-120, the Dash 80, which first rolled out of the factory in 1954, effectively helped Boeing establish its leadership role in the commercial jet airliner industry. The Dash 80's last flight has invoked recollections and emotions among Boeing people, especially those who prepared the airplane for this last journey. Among those individuals is Dave Knowlen, director of business affairs for Boeing Commercial Airplanes. Here is Knowlen's story of appreciating the airplane and bidding adieu to it, as told to Boeing Frontiers' Leslie Nichols. About six weeks ago I said farewell to someone who had been in my life, off and on, for almost 50 years. It was hard to leave her at the airport. But the good news is that starting in a couple months, Ialong with the rest of the worldwill be able to visit her whenever I want. "She" is not a person; she is the Boeing 367-80, the Dash 80. And as of mid- December, she'll be on permanent exhibit in the Steven F. Udvar-Hazy Center, the new annex to the Smithsonian National Air and Space Museum in Washington, D.C. I was 11 years old the first time I saw the Dash 80. That was July 15, 1954, the day the Dash 80 made her inaugural flight. My dad and I stood at the chain-link fence at Boeing Field in Seattle and watched her land. I thought she was the most beautiful airplane I'd ever seen. She was so radical and advanced for her time, with the unusual paint job and the swept wings, and she wasn't boxy and square like most of the airplanes before her. I had no idea we'd keep bumping into each other over the years, just as two old friends might. The next time I saw her I was in college at the University of Washington, where the airplane was studied for its technology and its business case. Then I came to work for Boeing in 1966, and when I was attending orientation I saw the Dash 80 parked across the street. I sneaked out of class to see her. A few years later on special assignment with the Supersonic Transport program I had the chance for another visit. This time the airplane had a long nose and avionics designed for the SSTjust two examples of the many ways she served as a test bed for 18 years. I didn't see the Dash 80 again until 1984 when I was on business in Arizona. The airplane had been sitting in the desert since 1972, when Boeing President Bill Allen donated it to the Smithsonian. I saw the airplane up close and was heartbroken by the peeling paint and the dust that had collected on the wings and fuselage. I came back, told some colleagues about it and showed them my pictures. A few years later we decided we should talk to Commercial Airplane Division President Dean Thornton about it. We showed him more recent photos and told him we thought the airplane might fall apart if Boeing didn't restore it. So in 1988 he gave us the go-ahead, and a full analysis of the airplane's structural and operational condition followed. I was on the board of directors of the National Aeronautical Association at the time, and we enlisted the support of their leadership. Everett Longworthy and Gen. Cliff Von Kann helped us connect with the Smithsonian. 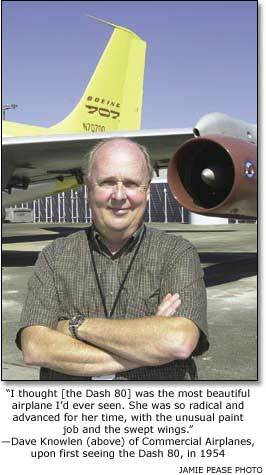 Martin Harwitt, then director of the Smithsonian, said he appreciated my passion for the airplane. Some senior people there, including leaders of the Commercial Transport wing, approved a loan agreement. The arrangement was simple: We would return the airplane to Seattle and act as its custodian until the museum could build an annex. With a team of experts from Flight Operations, we went to Tucson, Ariz., and towed the airplane to the nearby Davis-Monthan Air Force Base aircraft preparation facility. The team camped out at a local hotel for three months while they worked many long days. The Air Force and their Aviation Maintenance and Regeneration Centerespecially their leader Jerry Fugeregave us tremendous support. Finally, by early April 1990 the airplane was ready to fly. With Boeing project pilot Paul Bennett at the controls, we flew from Arizona to Boise, Idaho, for refueling, then from Boise to Moses Lake, Wash., to prepare for the brief flight home to Seattle. Shortly before the last leg of the flight on May 19, 1990, we flew from Seattle to Moses Lake all the retired Boeing senior executives who had a role in designing and building the Dash 80. They included Wally Buckley, former Dash 80 test pilot Alvin "Tex" Johnston, George Schairer, Joe Sutter and some others. Unfortunately Maynard Pennell wasn't able to fly back with us. Sitting behind the pilot all the way home to Seattle was Tex, who barrel-rolled the Dash 80 twice at the Seafair 1955 hydroplane races over Lake Washington in Seattle. Over the next 13 years I flew in the Dash 80 four times, but the proudest moment came when I sat in the same seat as Tex had when he flew it (though I wasn't flying, of course). As we came into Seattle over Lake Washington, I remember looking at Tex and seeing a big smile on his face. We also flew over the University of Washington, at the request of Joe Sutter, to thank the school for their contributions to Boeing. Finally, when we flew over the city of Seattle, air traffic control at Boeing Field authorized us for a flyby of the Museum of Flight before landing. When we approached Boeing Field we noticed that many cars had pulled off the freeway. And when we landed, we found out the gathering had drawn a crowd. It was quite an emotional moment. Once on the ground, Boeing President Thornton "T" Wilson re-presented the airplane back to Boeing. Over the next year or so we used the airplane in numerous public events and flew it a few times, including on July 15, 1991, to commemorate the 75th birthday of The Boeing Company. In 1996 the Smithsonian finally found someone to support the annex: Steven F. Udvar-Hazy, the CEO of International Lease Finance Corporation and a good Boeing customer. So, in 2002 I met with the National Air and Space Museum Director General Jack Dailey and Deputy Director Don Lopez, and we defined a plan to return the Dash 80 to the museum. In 1952, the Boeing board of directors decided to invest $16 million of company profitstwo thirds of company net profits from the postwar yearsinto a prototype jet transport, the Model 367-80 or "Dash 80." The airplane featured then-revolutionary features such as jet engines and swept wings. It was a huge gamble, but it paid off. The Dash 80 became the prototype for both the KC-135 Stratotanker, the first jet aerial tanker, and the Model 707-120, the first in the long line of Boeing commercial jet airliners. In the spring of this year I worked with Mike Conner and Ken Higgins in Flight Operations to take the airplane out of storage in Plant 2, select a new restoration team, and prepare the airplane for its final flight. On June 14 we moved the airplane across the street from the 2-40 hangar. My job throughout the project was mostly to keep any hurdles out of the team's road to restoration. It was a wonderful team of people. We were all leaders; each one of us did a great job. Finally, on Aug. 2, the Dash 80 made its first flight since 1991. I had tears in my eyes as the plane climbed, as gracefully as always. The heart and soul of The Boeing Company was back in the air again. The next day the airplane flew at Seafair over the same hydroplane course where Tex Johnston performed his barrel rolls 48 years earlier. In commemoration to Tex, the flight crewpilot Gerald Whites, copilot Charles Gebhardt, and flight engineer George Kegebeinwagged the wings at the crowd of 300,000 people. Tex's son Gary Johnston was there that day, too, and I had an opportunity to share with him my conversations with his dad. Just three weeks later, on Aug. 24, the airplane left Seattle for the last time. The flight plan included stopping for fuel, first in Rapid City, S.D., followed by two days at Wright-Patterson Air Force Base in Dayton, Ohio. Sitting on the tarmac in Dayton next to the airplane was a KC-135, the first derivative of the Dash 80. The second derivative was the 707, and Boeing made more than 1,000 of these. On Aug. 27, I stood on the runway at Dulles International Airport near Washington, D.C., with spectators and media waiting for the Dash 80 to complete its final flight. We heard the public address announcement that the historical airplane that launched the jet age was arriving, and that everyone inside the airport should run to the windows to watch this momentous arrival. Just like back in 1972, I noticed planes blinking their landing lights in salute to the Dash 80, to which all commercial transports worldwide owe their development. As the airplane taxied to a stop after making its very last landing, I looked up and saw pilot Whites smiling and waving. I got more than a little choked up, because a long odyssey between me and this wonderful airplane had come to an end. Like all journeys, though, I think maybe it was the start of another one for me and the Dash 80. I'm eager to attend the annex opening in December and say "hello" to my old friend. Looking back, I realize I was privileged to work with some wonderful people who developed great products at The Boeing Company. But more so, I am privileged to work for a company that values its history as strongly as it envisions its future. Back in 1952 the leaders of this company had the determination to make a tough decision and bet the company on the Dash 80. I hope that same spirit will lead Boeing through the next 100 years.